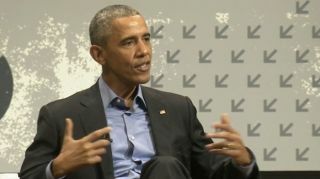 President Obama can't discuss the ongoing encryption battle between Apple and the FBI specifically, but during a keynote at SXSW 2016, he issued a dire warning to the tech world on the future of privacy if it doesn't act now. While, again, not talking about the specific San Bernardino iPhone situation, Obama said the tech sector needs to resolve issues around encryption, or it could face a far more hostile environment if it entrenches itself on the other side. "What will happen is, if everybody goes to their respective corners, and the tech community says, 'Either we have strong perfect encryption or it's Big Brother and an Orwellian world,' what you'll find is that after something really bad happens, the politics of this will swing and it will become sloppy and rushed and it will go through Congress in ways that are dangerous and not thought through," the president said. In the time since the FBI issued a court order demanding Apple build a special software to circumvent the security measures on a locked iPhone used by a terrorist, we haven't heard the president speak to the case nor the questions it raises. That changed today when moderator Evan Smith of The Texas Tribune asked Obama, the first sitting president to attend the annual gathering in Austin, where he stood on privacy versus security. Obama said as a society, we "agree" to lawful searches of our homes with warrants because "we recognize that there are some constraints imposed to make sure we are safe, secure and living in a civil society." But the fast pace of technological change raises questions and concerns of how far the government can go. The president said he believes "there are very real reasons the government can't just willy nilly get into smartphones that are full of very personal information." However, "really strong encryption" vastly complicates things. While the values of security and privacy are both important, for the president it comes down to this: "If it is technologically possible to make an impenetrable devices - there's no key, no door at all - then how do we apprehend the child pornographer? How do we solve or disrupt a terrorist plot? What mechanisms do we have available to do simple things like tax enforcement?" "If government can't crack a phone, then everyone is walking around with a Swiss bank account in their pockets," he said. So, for the president, that really only leaves one option: concessions. "My conclusion so far is you cannot take an absolutist view on this," Obama said. "If your argument is strong encryption no matter what, and we can and should create black boxes, that I think does not strike the kind of balance we have lived with for 200,300 years. And it's fetishizing our phones above every other value. That can't be the right answer." He continued: "I suspect the answer is going to come down to how do we create a system where the encryption is as strong as possible, the key is as secure as possible, it is accessible by the smallest number of people possible, on a subset of issues we deem important." Obama pointed to other concessions we make, such as the particulars of airport security and drunk driving checkpoints, as intrusions into our lives that we tolerate because "it's the right thing to do." "But this notion that our data is different and can be walled off from the other concessions we make is incorrect," he continued. "We have to make sure that it is narrow and it is constrained and there's oversight. I am confident we can solve it." Many will argue that taking off your shoes at the airport and stopping for a few minutes at a drunk driving checkpoint are nowhere near as intrusive nor potentially damaging as requiring a company to build a tool to break its own security measures, especially when it argues doing so would put many millions of innocent people at risk. But that's where the president left it. Obama is the first sitting president to attend the annual festival in Austin, Texas. First Lady Michelle Obama is due to speak at the event next week. The president also took a minute to digress into the Edward Snowden NSA leak, saying, "The Snowden issue vastly overstated the dangers to US citizens in terms of spying. Our intelligence agencies are pretty scrupulous on US soil. What those disclosures did identify were excesses overseas, people not in this country." He said a lot of those excesses have been fixed, though an independent panel will issue a grade on how well the government has done.